Canadian golfer Adam Hadwin plays a shot during the final round of the Desert Classic at the Stadium Course on Jan. 20, 2019 in La Quinta, Calif.
After a dramatic three-man duel in the desert, Canadian golfer Adam Hadwin fell one shot shy of earning his second career PGA title Sunday afternoon. The native of Abbotsford, B.C., went into the 18th hole of the Desert Classic tied with American golfers Phil Mickelson and Adam Long. Hadwin had a three-shot lead on the back nine, but it dissolved down the stretch as he settled for second. Instead, it was tour rookie Long who earned the win in La Quinta, Calif., his first on the PGA circuit. Hadwin came into Sunday’s final round in second place, trailing Mickelson by two strokes. Earlier Sunday, as the leading three teed off, the tournament looked like Mickelson’s to lose. But the Canadian got hot, making six birdies in his first 11 holes to take the outright lead. Ahead of Mickelson by three shots on the 12th hole, Hadwin appeared to be in the driver’s seat. But Hadwin’s lead was far from comfortable. Birdies would be hard to come by for the Canadian on his last seven holes. That wasn’t the case for Long, who birdied his way up the leaderboard with four of them in his last seven. By 15, he had tied Hadwin. Hadwin had a prime opportunity to take the solo lead back with a birdie putt, but instead he left his 11-foot putt just short of the hole. Then on 16, the Canadian decided to chip a ball he perhaps should have putted on the fringe, and he mishit it, leaving it frustratingly short of the green. Mickelson, the leader after each of the first three rounds, was battling too, but his putter turned ice cold. The Californian missed an eagle putt on 16 that would have given him the solo lead. The three men walked to 17 tied, and the gridlock continued onto 18. Long, ironically, was the only player to miss the fairway off the tee on the 18th. Instead, he hit a beautiful approach shot with the ball below his feet in dormant grass on a mound to the right of the fairway. He delivered it to 14 feet of the hole. Minutes later, the American was delivering an exuberant fist pump as his ball dropped for birdie and a final-round 65, winning at 26-under. Long took the US$1,062,000 top-place prize. Hadwin finished with a 67, as did Mickleson. They were both 25-under for the tournament. It was just Long’s sixth event on the tour. The 31-year-old American’s best finish to that point had been a tie for 63. It was the fourth straight top-six finish for Hadwin, who was trying to become just the second Canadian to win the event. Mike Weir won it back in 2003. Hadwin was looking for his second win on the tour. 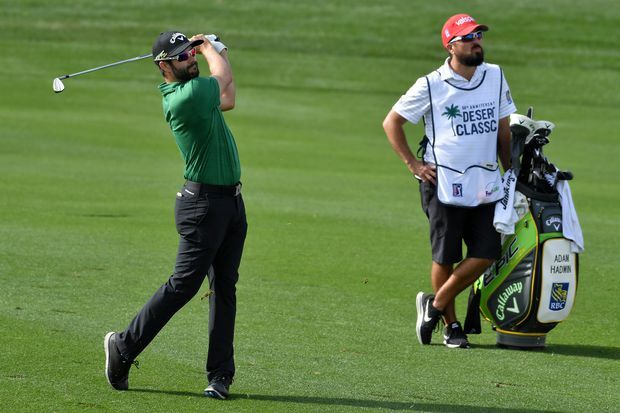 His first PGA title came on March 12, 2017, the Valspar Championship in Palm Harbour, Fla.
Hadwin is currently No. 70 in the World Golf Rankings.